…as a nation, we stood Tall and Proud? Our pride swelled as High as the Towers themselves. 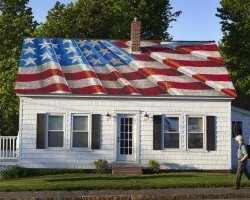 Remember when we unapologetically displayed our American flags in every possible place imaginable? With swollen chests we Flew them in our yards, from our car windows, stuck them on our bumpers. Remember when we placed flags in our living room windows and on our front doors? We dressed our children in “I Love America” T-shirts. Our greeting cards and our playing cards showed our pride. A PATRIOTIC ceramic candy bowl would sit at the Check-in window at your doctor’s office. The pen they offered you at the bank was red, white and blue. The grocery store display, was created Patriotically. And if you didn’t already own anything with ‘The Red, White and Blue” on it you felt a sense of regret…and you went right out and bought something. A blanket for the bed, a poster, a coffee mug. It didn’t really matter what. Remember when big pick-up trucks would fasten an Enormous American Flag on the back and drive down MAIN STREET USA, solely for the purpose of attracting turning heads, waving hands, beeping cars and Unity. Flags would hang down over highway overpasses and we’d focus on them until we drove underneath them. When as a terrorized and frightened nation… the Precious Wound was Shared! When the accusation of bigotry wasn’t connected to ones Love of Country. There was a sense of Unity, that was palpable. Compelling. You would almost swear you could touch it. Pride flowed through our veins with a Warm rush. It was a shared wound, a wound that we each claimed, individually and jointly. A wound and a heartbreak, So Precious. In the uniqueness of this… there was a CONSCIOUSNESS of something Extraordinary. And IN this consciousness, it made each of us Better. There was a camaraderie on the street. Old friends got in touch. People went back to church. We held doors for each other. We said please and thank you. Do You Remember that Precious Wound? That wound made me a better Human being and an unapologetic, Stand-Up, Come and Get it, BadAss American. God help us all, if we ever forget that precious, precious Wound.